Trying your pen at writing in different literary genres and sub-genres (there are so many!) is great writing practice. Try it and you may discover you are a poet when you thought you were a novelist, an essayist when you thought you were a playwright. Or a travel writer! Try something new. It may end up in a literary magazine. Literary travel writing is really about the experiences of the writer in a certain locale, rather than a straight forward guide or itinerary. It’s writing that aims to seduce the reader into wanting to go there, or not, and can be fiction or non-fiction. A little caveat if you try this. Forget everything you have read about your travel destination and write about your own experience. This is a good place to practice showing not telling. Put your readers there without clichés or superlatives (tricky if you have fallen in love with a place) and let them decide what they will. Here’s my literary travel piece. Not to ever compare myself to Woody Allen but I am inspired by the way his camera makes love to his favorite cities: New York, Paris, Rome. An Elegant Parisian Woman of a certain age shocked me the other day during a recent stay in Paris. She had short straight gray hair and was dressed in a slim suit, her scarf poofed out in that mysterious french way that only les parisiennes seem able to manage, insouciant and perfect. She wore very high heels. She walked through the Place St. Sulpice, a quiet corner of Paris on the Left Bank in the 6th arrondissement, where a group of young boys were running and kicking a soccer ball around. Bang! The ball came straight towards her. In a blink the woman lifter her nylon-stockinged leg and gave the soccer ball a mighty kick back to the boys. She didn’t look at them. She just walked on towards the church ahead. I took out my writing pad, delighted. Which morsel will you choose? My treat! The raspberry, litchi and rose petal macaron, Chef Hermé’s signature flavor? Or a dark, decadent, chocolate sable cookie? On our way back to the bench on the square, our taste buds transported and our sense of well-being heightened, we pass the Café de la Mairie on north side of the square. It’s a simple little neighborhood café where to me even the decaf coffee is strong and sublime. Not to mention the tartine, a half baguette with just the right crunchiness in the crust and fresh country butter at room temperature. 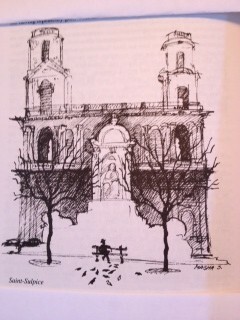 We pass the newsstand on the corner of the square and I nod to the vendor. He is so grouchy, that man, but I have a fond feeling for him. 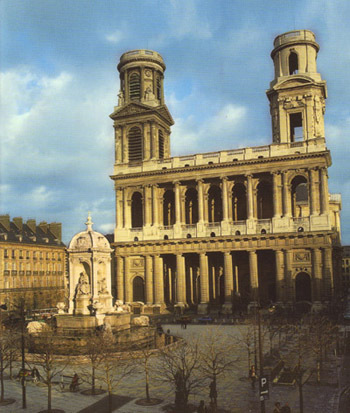 The Eglise de St. Sulpice sits solidly on the east side of the square. 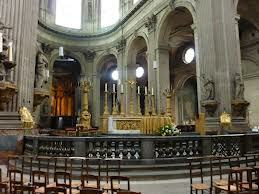 It’s a clunky-feeling church, I find, somber and still inside with massive columns and small chapels. Standing beside the columns is grounding and leads one to daunting philosophical thoughts like, “Where do I, an infinitesimal breath of being, fit into this Universe?” Delacroix’s masterpiece mural, “Jacob Wrestling with the Angel” is right there in the first chapel on the right, now obscured by scaffolding for refurbishing. It’s dark too, like the church. Leaving the church into the brightness of the outside I am always saddened by the raggedy gypsy child on the steps outside. His mother pushes him towards me for alms. His huge eyes are hard to forget. Back to the bench to contemplate the looming Fountain of the Four Bishops. They have a kindly air. The whopping, big stone lions who protect them are comforting too, as far as lions go. It’s April and the Chestnut trees that surround the square are just about to bloom pink. Not quite yet. It’s still chilly here. There. You like it here too, right? I see that you are bringing out your book to read and are settling in. Bonne Journée. Contentment As in a feeling of well-being. 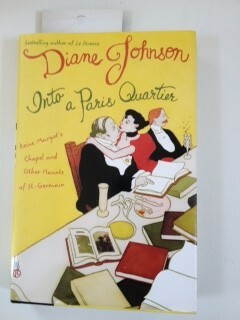 For me sitting on my bench, writing or reading, savoring that certain feeling of Paris-ness. Thanks. I was really stuck tonight. I think I will work on place.